I use this chain for long distance touring and is perfect for my needs. I dont need ultra light, I need a chain that will not let me down in remote locations. Merlin prices are ausually very good. The XT chain has been my preferred chain for a few years now and once on it is something I don't need to worry about. Survives my infrequent cleaning and lubrication very well. At the Merlin price it is a great investment in peace of mind every 6 months or so. Great value and good solid reliable performance. Good standard shimano 9spd chain. Comes with the connecting pin so you will need a decent chain tool. Good chain at a fair price, skipped the Shimano link pin provided and used a 'missing link' as I have had the original supplied pins pop under stress in the past. What else to say, its a chain, I replace them every few months. Did the job perfectly to replace a wrecked chain. Straightforward to fit with the right tool (used the Icetoolz Pro Shop Chain Tool) and I am no mechanical genius! Runs well, no problems. Great value chain that lasts well and shifts cleanly. Bought to replace a PC991 that was noisy over my new 9spd Ultegra cassette, problem solved. Quiet drivetrain. Nice and easy to fit with the Shimano break pin. Shimano quality, 22 years of mashing groupsets to dust they have never let me down, this has the silver side plates which always look better than rust. Smooth shifting, quiet and easy to install. This chain replaced a KMC that I find very good indeed (though I see people indicating KMC make Shimano's chains? ). Price was identical and more links for the wide gear system that I run. Used the Shimano joining pin as for emergencies I have KMC links and nor am I intending removing chain before its worn out. Early days but very smooth gear changes and quiet running, never had any previous issues with Shimano simply prefer KMC's installation method. Good value for money. Used SRAM power link to join rather than the Shimano one-time-use pin. Great experience ordering and low price. Will order from merlin again. So far the chain is working great. This is the forth one on this bike so I know I was getting a good product. The chain is of the standard you would expect from Shimano and does not disappoint. Along with a new cassette it is as smooth as when I bought the bike new. Working fine so far. Bit of a pain to install though. I just hope it lasts longer than its SRAM counterparts, which in my experience are abysmal at lasting. Super slick at a great price. XT never disappoints! I've used XT chains before and IMHO they're slightly better than the SRAM equivalent. Very good price from Merlin, and quick delivery as always. Does what it says on the tin... Good chain at a good price. Tried a few others, always ended up back with this one. Great chain, I run full XT and I don't see why people choose anything else. It is affordable and shifts smooth and precise. These chains have never snapped on me and I only change them once they stretch far enough to warrant replacement. 5 stars for a great product and Merlin supplies at an unbeatable price again! Was looking to replace the chain on my winter road bike and saw this chain on Merlin Cycles website on offer. This is a nice looking and well made chain with a silver finish with enough links to cover any gear range. The only downside is the Shimano pin for fitting the chain although not a problem for me as I can use a chain tool which you will need to shorten the chain anyway, it may be a problem for those not used to this method of fitting a chain, but you can use a quick-link which has to be purchased separately. This is an excellent product! Great offer!! Congratulations to Merlin for the great service and very quick delivery! Please continue with good prices in products and shipping. 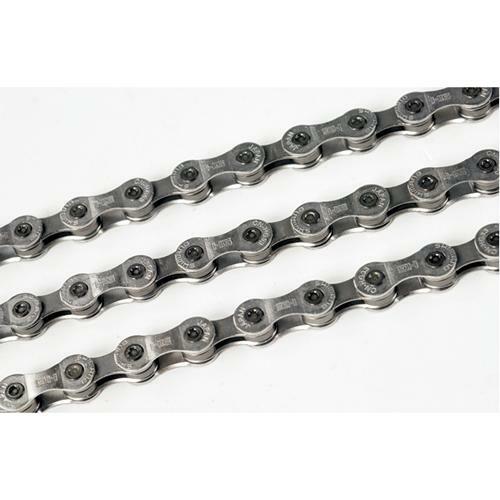 Top quality chain from shimano with the backup from merlin of fast delivery, discount at checkout & A1 customer service. Usual superb service from Merlin. All the parts you need, delivered super quick at unbeatable prices! what else can I say. Don't waste your time with anything else - these are the daddy of chains - strong and light, easy to fit and you can get a good season out of one of them. What more do you want? One of the best chains, I have it on 2 bikes, used hard, - no complains. Decent chain for the reasonable price. Product was as expected, and faster than going to the LBS. cant really rate this component, its only been on the bike a few weeks.